Objective: To describe the resolution of medial femoral cutaneous nerve palsy utilizing chiropractic interventions and IASTM. Clinical Features: A 64-year-old man sought care for low back pain and pain extending into his right medial thigh that had been present for 1 month. 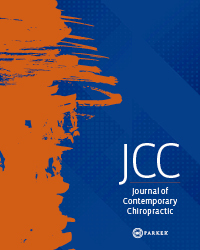 Intervention and Outcome: Chiropractic management, including spinal manipulation, McKenzie procedures, and IASTM was used to resolve medial femoral cutaneous nerve palsy. Conclusion: Our case identifies a patient presentation that suggested discogenic pain combined with peripheral nerve entrapment. The combination of spinal manipulation with end-range loading should be studied in more detail. 6. Suri P, Rainville J, Katz JN et al. The accuracy of the physical examination for the diagnosis of midlumbar and low lumbar nerve root impingement. Spine 2011;36(1):63-73. doi:10.1097/BRS.0b013e3181c953cc. 15. Durante J, Macintyre IG. Pudendal nerve entrapment in an Ironman athlete: a case report. J Can Chiropr Assoc 2010;54:276-81.